From just about every angle, batch cooking just makes a lot of sense for large families. But you may believe batch-cooking for smaller families is unnecessary, or even a waste of time or money. By now you realize that I love the concept and practice of batch cooking. Batch-cooking allows you to have better control of what you feed your family, prepare healthy foods in advance to avoid eating out when life gets busier than usual and save time and money at the grocery store. Batch-cooking is something that I often recommend to friends, family, and clients and it’s something that I try to do regularly to feed my own family healthy meals. 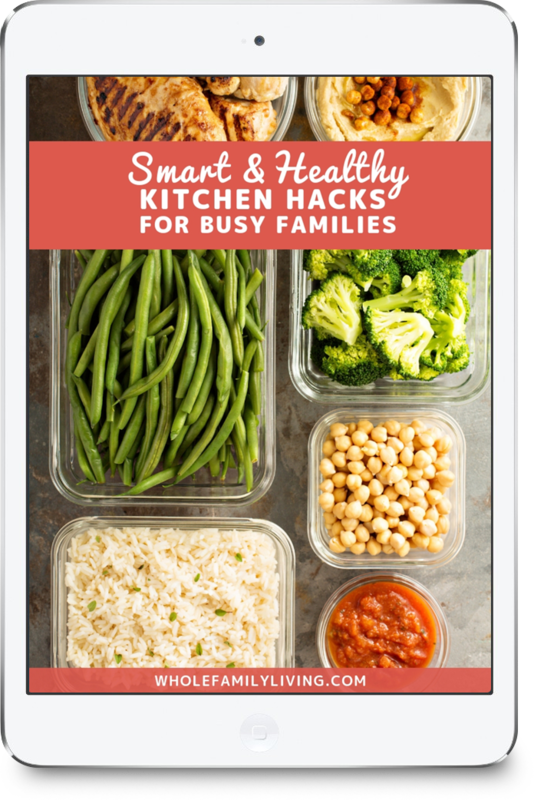 In the “Smart & Healthy Kitchen Hacks for Busy Families” guide, I outline the simple steps for creating healthier meals and saving time in the kitchen when your family schedule is jam-packed. If you’d like a free copy of that guide, just request a copy here. 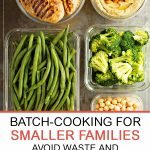 When you think about these benefits – saving time in the kitchen, spending less money at the grocery store, avoiding food waste, and allowing you to eat more real, home-cooked meals at home – you can’t dispute that batch-cooking is something that can benefit just about anyone or a family of any size. Well, at least that’s the way it’s supposed to be. You see, batch-cooking is one of those things that sounds really smart in theory but doesn’t always pan out the way it’s supposed to. And even though you would think anyone could benefit from these strategies, the plain and simple fact is that not every family will benefit from batch cooking. 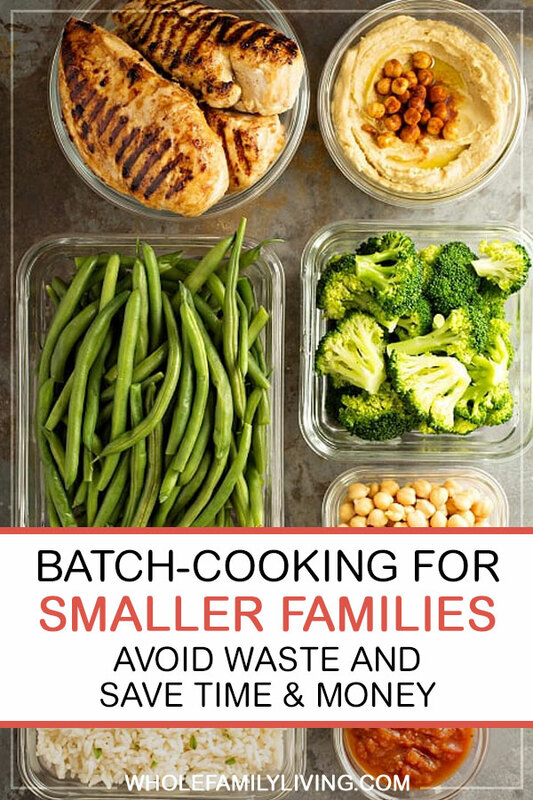 And batch-cooking for smaller families can be even more tricky leaving you open to potentially over-spending, spending a disproportionate amount of time prepping and cooking meals, or throwing much of the uneaten food away in the trash. According to the USDA, up to 40% of America’s food supply goes to waste. As in, ends up being thrown away, uneaten, in the trash. This figure is astonishing and even ironic given the fact that if you ask most Americans they’d probably say that preventing food waste in their home is a priority. I haven’t surveyed on this but I’m thinking this is how you may feel as well. I don’t know about you but I cringe whenever I see something that “should” have been eaten thrown in the trash. Could batch-cooking be a solution to help eliminate food waste and help families plan out healthier meals in the process? There is no right or wrong way of how to batch-cook but there are a few universal principles that you’ll find in common when you search out any information on the web. If you want to get really fancy, you can pre-portion meals in containers like these to make sure you have all meals accounted for. Sounds very involved, doesn’t it? Well, it is. And that’s why so many smaller families go belly up on batch cooking. They simply over-complicate the whole thing. 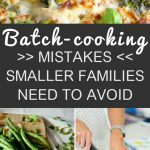 So how can a small family take advantage of all the benefits of batch cooking without going broke or wasting valuable time? 1. Define batch-cooking for your own family. Batch-cooking is not one-size-fits-all and there is no standard definition or process. Batch-cooking for one family may mean cooking two meals at the same time. For another family, it may mean having several meals pre-cooked or prepped and frozen for the coming weeks. Define batch-cooking for your own family’s needs and continue to refine your process until you find your sweet spot. Every health trend is not for everyone. And batch cooking might be one of those that just doesn’t work for you for your family. 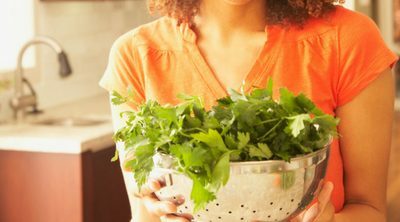 If you’ve tried batch cooking but keep running into problems, it might be time to look for another way to prepare healthy meals. Consider doing only a few steps of the batch-cooking routine or eliminating batch-cooking altogether. The entire purpose of batch cooking is to avoid waste, so if batch cooking is costing you more either in time or spending more money at the supermarket, cease and desist. 3. Do a “modified” version of batch cooking. Does batch cooking sound good in theory but you’re not sure how to get going? Don’t despair. You can pick and choose the parts of batch cooking that do make sense for your family. For example, pre-chopping veggies for use in meals for the week can be a real time-saver. Make larger batches of certain foods that you know you will use up and store them in the refrigerator or freeze them for later. Pre-chop and pre-bag fruits and veggies for smoothies for the week. Pre-portion snacks for the week. 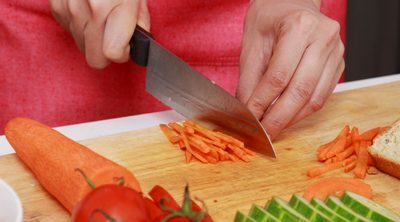 Half the battle in batch-cooking is planning and “pre” doing things like portioning, slicing, and chopping, so if you can do even just a few of these things you’re several steps ahead! 4. Know how much your family actually eats. The reason we wind up with so much food waste is that we simply don’t calculate how much we actually need to eat at every meal. If you are a smaller family (who grew up in a larger family, for instance) you may still be operating with a large family in mind as you plan and prepare meals for your small family. If your kids are grazers, you may be cooking larger meals that will technically never be eaten. Take a look at the proportions of foods you’re preparing for each meal and be sure to buy only what you need in order to prepare the right amount of food for your family and avoid throwing out food that doesn’t get eaten. 5. Think twice about wholesale stores. Have you been lured into a wholesale mindset and started shopping in “bulk” thinking that you’re going to save a ton of cash on groceries? While there’s no doubt that some of the deals at the wholesale club are unbelievable, beware and only invest in one of these memberships if you are confident it will pay off for your family. For instance, visit your local BJ’s or Costco to do a walkthrough and determine if the things they have on their shelves and refrigerator cases are already a part of your family’s eating plan, or are things that you’re sure you will add to it. While the supersized kale salad mix and multi-pack of milk alternatives may be a deal at the wholesale club, they may actually decompose or expire in your refrigerator before you even have a chance to consume them. Buy in bulk only when it makes sense for your family size. And when you do buy groceries in bulk, be sure that the items you are purchasing are already a part of your upcoming meal plans. A wholesale club membership can definitely help you save on your family’s grocery bill if used strategically. If you think this is something you’d like to look into, sign up here and I’ll send you the detail on how to receive a $25 gift card to BJ’s. Get the details here. 6. Get a batch-cooking buddy. 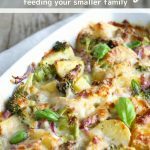 If you have a close friend or family member (in a different household obviously), why not pair up and batch cook together for your two small families. Chances are you get together on weekends, birthdays, or other special events. 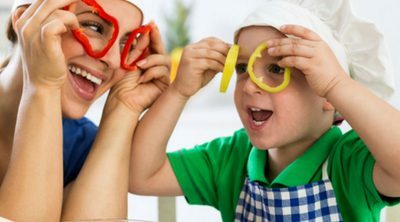 Consider planning out meals together that both of your families can enjoy. Sharing the cooking responsibilities (and swapping your favorite family dishes) cuts the cooking time for both of you significantly. Build your batch-cooking plan around ingredients that can be incorporated into several dishes. For example, when you cook a large pot of brown rice, you can repurpose this into many meals throughout the week like a stir-fry, tacos, stuffed peppers, zucchini boats, or even salads.